Any typical developer will maximise profit by building as much selling space as possible within an acquired plot. However, Gamuda Land is not a run-of-the-mill developer. Grounded in deep resources, its priorities are masterplanning, verdant landscapes, recreational spaces and infrastructure to create a conducive living environment — yes, elements that do not generate direct revenues. Paradoxically, these “non-profitable” entities are the very contributors towards its properties’ impressive capital appreciations, sealed in five consecutive “Value Creation” awards won for its Kota Kemuning and Bandar Botanic in Selangor and Horizon Hills in Johor. “We find it pointless to acquire land just to build it up and gain our construction profit. Instead, we want to create an address and location that people want to live in, talk about and appreciate,” establishes Gamuda Land’s managing director Chow Chee Wah. Most recently, the decorated developer has also been ranked among the Top Ten Developers in the nation by The Edge Malaysia, along with two Value Creation awards for its Enya at Ambang Botanic 2 and Gamuda Biz Suites. The accolade, bestowed on Gamuda Land for the fifth consecutive year, is a testament to its mission to create values that can withstand the passage of time. “Our commitment goes beyond the norm. In every development that Gamuda Land undertakes, you have the assurance that we will continue to skilfully leverage our wealth of experience, expertise and innovative solutions to effectively improve quality of living, deliver long-term value and build sustainable communities,” states the company. Backed by Gamuda Bhd, which has a strong reputation in engineering, construction and infrastructure in Malaysia as well as Asia, Gamuda Land is led by an experienced team with high quality expectations. The distinction is reflected in its accomplishments under the internationally-recognised Construction Quality Assessment System (CONQUAS). In May 2016, its Jadite Suites in Jade Hills, Kajang achieved the highest CONQUAS score of 82.8 out of 100 for residential high-rise building category in Malaysia. Last year, Madge Mansions, its luxury 52-suite development in Kuala Lumpur was similarly bestowed. Its landed property in Bandar Botanic, Klang, at 88.6 points, has remained the top CONQUAS scorer in the country since 2012. Armed with more than two decades of technical know-how under its belt, Gamuda Land takes pride in producing innovative ideas which has set many precedents in the country’s development industry. In its maiden project, the now well-known Kota Kemuning township in Shah Alam, it implemented subterranean wiring in 1995, where all the service cables are buried underground. Subsequently, the Shah Alam Council studied it and mandated it as a requirement for all townships of certain scale. “We built the necessary earthwork and infrastructure to ensure that from the first phase to the final phase 20 years thereafter, things would still be applicable and usable,” Chow explains. “When you buy Gamuda Land property, you are buying into the future. We create and add value not only for you, but for generations to come, by leveraging our ‘hard skills’ such as engineering, infrastructure development and visionary master planning, and turning them into ‘soft skills’, such as landscaping, parks, greenery and environmental architecture,” says Chow. Underpinned by a three-pronged approach – good master planning, beautifully crafted environment and strategic location – Gamuda Land ensures their developments are poised for sustainable growth. Knowing that Rome wasn’t built in a day, Chow reveals that the team spends considerable time in drawing up a comprehensive masterplan to ensure long-term viability. “We plan and design every aspect of the development – infrastructure, road systems, security and safety, current and future precincts, right hierarchy of community spaces and facilities and amenities – so that the community can organically expand in population and activities with ease. Gamuda Land’s developments’ appeal lies in its natural beauty, enhanced under the hand of professionals. The company firmly believes in eco-friendly treatments rather than the simpler option of demolish-then-build. This principle is well-displayed in Horizon Hills, where Gamuda Land was the first developer to embrace the original topography of the undulating terrain. As a result, scenic slope-hugging residences can be seen along its natural contours. In Kota Kemuning, Gamuda Land works with mother nature by incorporating lakes and ponds to serve both recreational and functional purpose. Its wetlands, besides serving as picnic areas, also act as a flood mitigation mechanism. Its intricate landscaping is purposed to provide a lush verdant environment for its residents to connect with the beauty of nature for a healthy, wholesome lifestyle, says the company. Besides these, the developer provides a right mix of clubhouses, communal parks, playgrounds, lifestyle retail services and entertainment centres to facilitate bonding among families as well as the community. “I really like the place I live. When my friends come, I feel proud of showing them my house, and not just the house, but the surrounding. Very nice environment, bring them to the lake, parks, etc,” said another resident. While The Robertson, its transit-oriented development adjacent to the Bukit Bintang commercial centre fits the conventional “strategic location” concept, Gamuda Land is well-known for turning unchartered territories into successful townships. 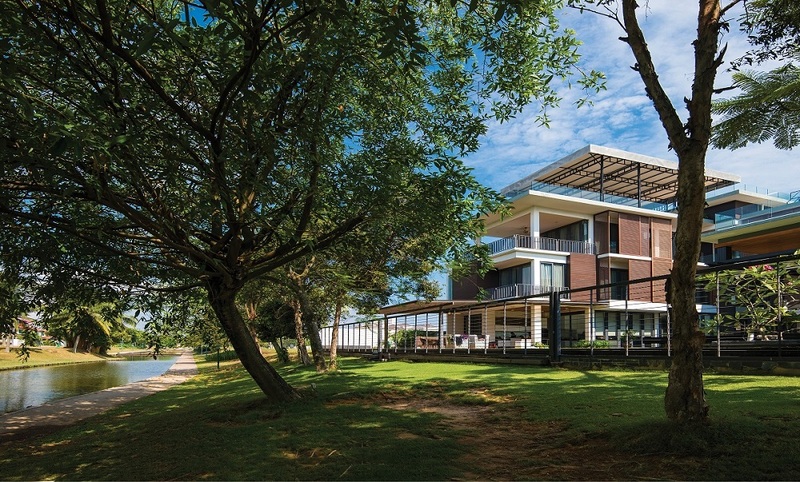 Supported by a parent company specialising in infrastructure construction, Gamuda Land has transformed many once-remote areas into thriving landmarks such as Kota Kemuning and Bandar Botanic, both well-connected by Gamuda’s Kesas Highway. Besides integrating roads, the firm ensures its developments are well-connected via public transportation. “Our developments are near train stations and we provide direct shuttles to these stations,” he adds. At the heart of the value creation is a well-planned development underpinned by a good location as well as an environment that balances natural beauty with extensive amenities. As evidence of its sustainable values, Gamuda Land’s property buyers have been enjoying enviable returns on their investments. In winning The Edge–PEPS Value Creation Excellence Awards from 2012 to 2016, Gamuda Land’s properties in Bandar Botanic, Kota Kemuning and Horizon Hills boasted annual appreciations of between 21% and 47%. In Bandar Botanic, its link houses, priced at RM556,000 in 2010, achieved a handsome margin of RM614,000 in the secondary market last year. Another feather in its cap is its condominium in Kota Kemuning, which recorded a capital appreciation of 237% within five years. In Horizon Hills, its two-storey terraces have earned returns as high as 117% over three years. Bungalows there tagged at RM2.43 million in 2011 now commands a resale value of RM5.4 million. Another proof of buyers’ confidence in its sustainable values is the high number of repeat buyers and referrals. In Bandar Botanic, a total of 90% and 70% existing customers bought the two-storey and three-storey properties respectively. Riding on its reputation, the developer is set to pioneer another frontier in the north of Sungai Buloh. Proving the developer’s sharpness in identifying places ripe with potential, Sungai Buloh has been ranked the third locale most likely to experience a property boost from the Sungai Buloh-Kajang MRT Line 1 expansion. As reported in TheEdgeProperty.com recently, real-estate observers have highlighted property appreciations between 17% and 31% over the past six years in Sungai Buloh, adding that there is still much room for further increases. To ensure that it starts on the right foot, Chow discloses that they chose this parcel in Sungai Buloh North even despite its premium price because it was at a confluence of the Guthrie Corridor Expressway, the LATAR Expressway and the North-South Expressway, which effectively connects the development to all key points of the city. On this promising site, Gamuda Land is building a 900-acre development comprising Kundang Estates (90 acres) and Gamuda Gardens (810 acres), boasting a combined gross development value (GDV) of RM11 billion. Striving to raise the bar, the company states that it will be “a showcase of the developer’s ambition to dramatically change the face of northern KL”. Based on the concept of modern countryside living, Kundang Estates is fashioned to enhance the essence of the idyllic and neighbourly lifestyle which Kundang embodies. Kundang Estates features four interconnected parks that cater to different ages, namely the Lakeside Gardens, featuring a lake with a scenic jogging and bike trail; the Esplanade with flying fox facilities, embedded trampolines and a landscaped flower lane; Adventure Parks, featuring an extreme bike trail and a kid’s playground and the Community Farm, where residents can bond as they do organic farming for personal consumption, guided by professionals. Targeted to upgraders from the vicinity and those who want to escape the city’s din and dust, the low-density project offers 573 double-storey terrace homes. It will be open for sale this month. 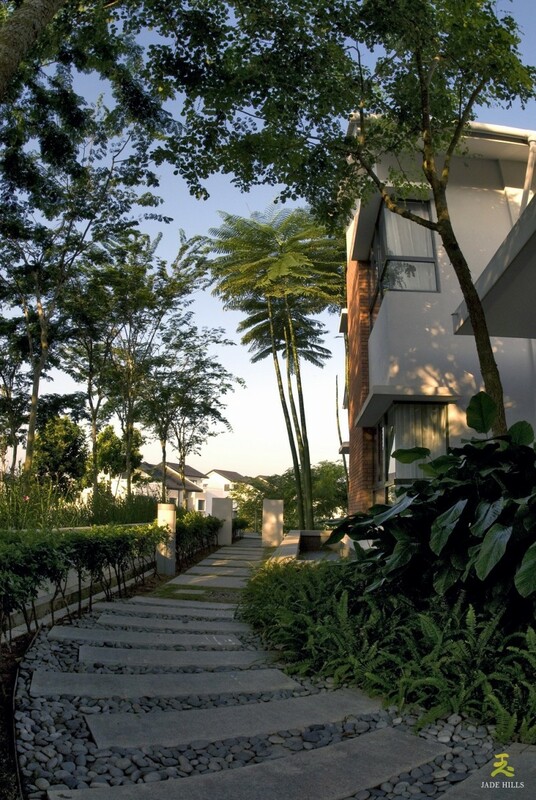 Carrying its name, Gamuda Gardens is an epitome of its brand. The mixed-use development is masterfully crafted to preserve its undulating hills and indigenous trees, complemented by a 50-acre central park comprising five cascading lakes, flowing into a majestic waterfall. A mixed-terrain cycling trail navigates around the lakes in a scenic route. Reflecting its fervency to ensure the wellbeing of its residents, Chow shares that based on health research, negative ions produced around moving water resources such as waterfalls work to induce natural body of chemicals that uplift the mood and boost daytime energy, supporting Gamuda Land’s claim to be a place “where happiness lives”. Cascading lakes also bring a balance to the ecosystem. It makes the environment cleaner and acts like a filtration system. The park around the lake includes an adventure playground that features slides and zip lines built into the existing terrain for children to glide across the gentle valley. There is also a fully-equipped camping ground that’s secure and convenient. At the heart of this development is a vibrant waterfront village, where residents can gather for coffee and food, pick up their daily supplies or indulge in a little retail therapy. It is envisioned to be a social and economic hub that will benefit the surrounding areas as well. “Lifestyle offering and amenities will be further enhanced with the upcoming Lifestyle Retail and Business Hub where spaces will be built for offices, retail, boulevards, hotels, entertainment outlets, medical centres and more,” Chow shares. Enveloped in this green haven are an array of dwellings ranging from premium signature homes with striking facades and hill villas to modern serviced apartments, catering to newlyweds, couples in their golden years and growing families. Besides neighbouring Sungai Buloh, Subang, north of Petaling Jaya and Damansara Perdana are reachable within 12 to 15 minutes while Kuala Lumpur requires only a 33-minute drive. Alternatively, residents can take advantage of the direct shuttle bus to Kuang KTM, which is only one station away from the Sungai Buloh MRT, the Integrated Transport Terminal which connects to virtually anywhere. Homeseekers and investors can look forward to the launching of Gamuda Gardens in the first quarter of 2017. In Kota Kemuning, Gamuda Land is moving forward with a lifestyle integrated development dubbed twentyfive.7. Built on 257 acres with a GDV of RM3.8 billion, it boasts of “striking designs and new concepts never seen before in Malaysia”. Inspired by the avant-garde lifestyle of the millennials, it features a vibrant waterfront hub with creative retailers and shops such as artisan cafes, specialty stores and concept restaurants, along with community spaces for performing arts and events. The pulsating domain is targeted at millennial-minded homeseekers as well as young creative start-ups looking for a community to share ideas and inspiration. It will be launched in the second quarter of 2017. “We are confident that our new developments will be truly unique offerings that will get the public excited,” Chow concludes. This story first appeared in TheEdgeProperty.com pullout on Nov 18, 2016, which comes with The Edge Financial Daily every Friday. Download TheEdgeProperty.com pullout here for free.